While digging out stumps by hand with an axe or shovel is a viable option in removing small tree stumps, larger tree stumps require more drastic measures. More expensive and labor-intensive, although still effective methods, include renting a stump grinder or backhoe. Two other alternate, inexpensive methods provide an easy, virtually labor-free way to remove large stumps. Drill 1-inch holes with a 1-inch spade bit with a spade bit extension around the stump&#039;s perimeter. Drill to about 12 inches deep and 3 to 4 inches from the edge. Drill holes 3 to 4 inches down from the rim on the side of the stump at a 45-degree angles to help with venting. Pour 3 to 4 oz. of stump remover chemical granules into each hole and then fill the holes with water. Wait four to six weeks for the stump to completely decompose. 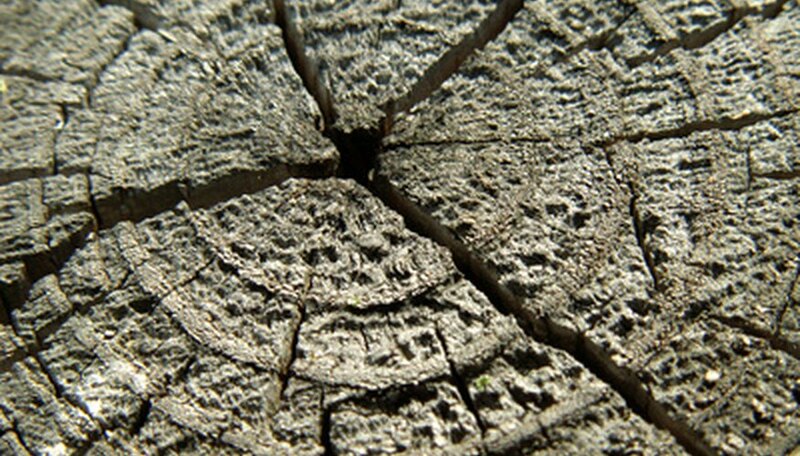 Break apart the spongy, rotten wood with an axe and dispose of in an outdoor trash container. Set scrap pieces of wood on top of the stump. Light the pile with a lighter or match when you have a thick pile collected on top of the stump. Mix some brush, such as smaller sticks and weeds, into the wood pile to heat up the fire. Place pieces of wood on top of the stump as needed to keep the fire burning. Allow the fire to burn until it burns through the stump.